100% cotton cap in faded black. Hand distressed with a vintage Super Bee patch. Adjustable with a brass fitting closure. One size fits most. A little history of the Vintage Super Bee . . . The Super Bee was restyled for 1970. To make it different from the Coronet that it was based on, the Super Bee did not get the fake rear fender scoops as standard equipment. It also had horizontally divided tail lamps. New options included a hood tach and spoiler. Buyers could order the R/T type Bumble Bee stripe or pipe-shaped upper and lower rear fender stripes with a circular Super Bee decal between them. The Super Bee was available in a number of wild colors, such as Plum Crazy, Sublime, and Go-Mango. Base prices fell $64 but sales dropped to about 15,500 units. Hemis were installed in just 32 hardtops (21 with four speed) and 4 pillared coupes (all with the four speed). 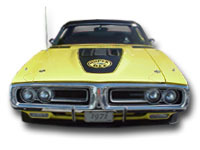 This was the last year that the Super Bee was based on the Coronet. The Super Bee switched over to the Charger platform for 1971 but still represented a low-cost, high performance package. Priced at around $3,271, the Dodge Charger Super Bee included a 383 cid Magnum V8 with a single four barrel carb rated at 300 bhp (down 35 bhp from the year before due to detuning), and a three speed floor shift, power bulge hood (black finished), tape stripes, Bee decals, and a Charger 500 interior, except with a standard bench seat. The Super Bee also came with a heavy duty suspension, big fat F70-14 tires, and a long list of optional equipment. Still optional (for the last year) was the 440 Six Pack and the mighty 426 Hemi, rated at 385 bhp (down 5 bhp) and 425 bhp respectively. Only 22 Hemis were built, nine with four speeds, and 13 with the Torqueflite. — Dodge Super Bee History. N.p., n.d. Web. 22 July 2017.